It goes without saying that the NHA staff is crazy about wild animals – after all, it’s our job to introduce our guests to the world’s most amazing wildlife encounters! 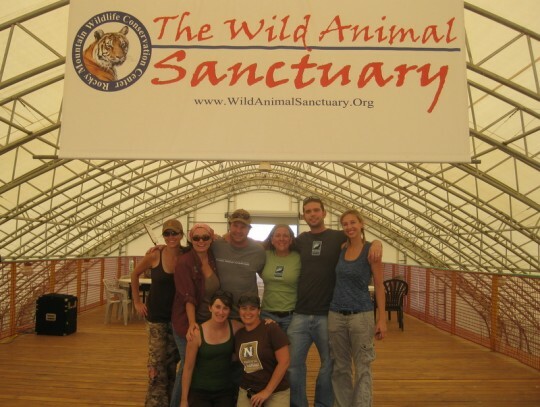 So when we were brainstorming where to hold our inaugural Staff Volunteer Day, a near-unanimous decision was quickly reached to donate our time to the Wild Animal Sanctuary not far from our Boulder office. Now, as the natural habitat experts, we’re not big fans of animals in cages and enclosed spaces. But the Wild Animal Sanctuary is a different story. This extraordinary rescue facility has set out to help alleviate our country’s captive wildlife crisis. It has been estimated that as many as 30,000 captive large carnivores living in sub-standard conditions across the U.S. alone! Lions, tigers, bears, mountain lions, jaguars, wolves, leopards and other species are bred, traded, abused, exploited, and abandoned everyday. Some are former circus animals, others were pets, and still others were bred for commercial use (we met a black bear that had been de-toothed and de-clawed so his owner could sell opportunities to wrestle a bear!). When these animals are discovered by local law enforcement, staff from the Wild Animal Sanctuary trek to the far corners of the country (and beyond!) to rescue the animals and bring them to the safety and care of this expansive facility in rural Colorado. It’s truly an inspiring place – the sanctuary and its staff are dedicated to providing these animals with a safe haven where they receive the best care possible. 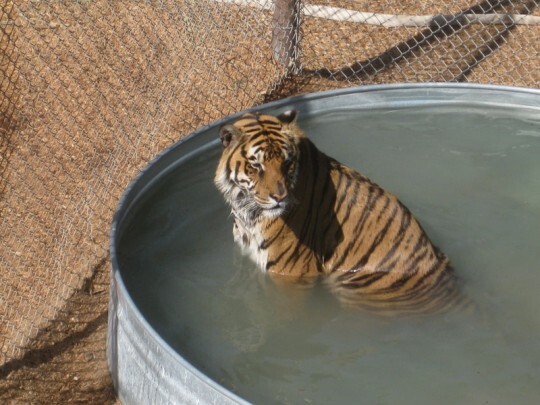 Tigers enjoy a chance to cool off in the Colorado summer heat! Upon arrival at the sanctuary, the Nat Hab crew was eager to help out and get our hands dirty (and we did get our hands DIRTY! 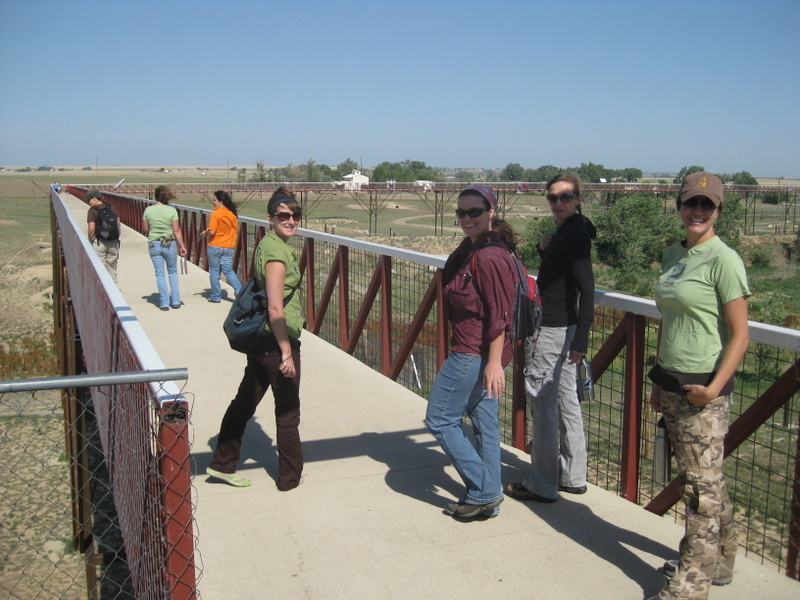 ), but first we got a quick pre-volunteering tour of the facility and the recently completed boardwalk that spans across the animal habitats. It turns out this was an important step – getting to know the cats, bears, and wolves we were helping out made the dirty work that much more meaningful. We were enamored by the growls of the tigers (including one rare white tiger), the majesty of the lions, the howls of the wolves, and sheer size of the grizzly bears. The boardwalk provided a bird’s-eye view with uninhibited proximity to the animals as they wandered their space or basked in the sun. It was quite the strange feeling to see leopards, lions, and tigers roaming around rural Colorado! With promises that we would return to the animals later, we were off to the Carnivore Nutrition Center – the food preparation facility. 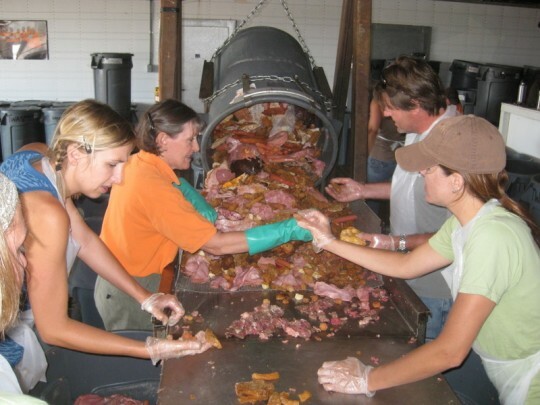 Our job was to assist with meal preparation, and with more than 200 carnivores at the sanctuary eating more than 20,000 pounds of flesh each week…well, that’s a lot of meat! Feeding these animals is a rather expensive endeavor, but fortunately, grocery stores around the state donate expired meat products, greatly subsidizing food costs. It turns out that tigers can only stomach certain types of human-processed meats, and lions really only prefer others, and bears – they eat just about anything. Half the Nat Hab crew was placed on sorting duty – chicken in this bucket, pork over here, and beef in that bucket. And while loads and loads of raw meat was tossed around, the other half of our crew prepped the actual meals – frozen buckets of meat-mix servings for each type of animal. Yummy…. After a few hours of meat-tastic food prep, we were again rewarded with some awesome animal viewing – this time of a group of 25 lions rescued all the way from Bolivia! And, in true Nat Hab fashion, we finished the day with a celebratory beer! 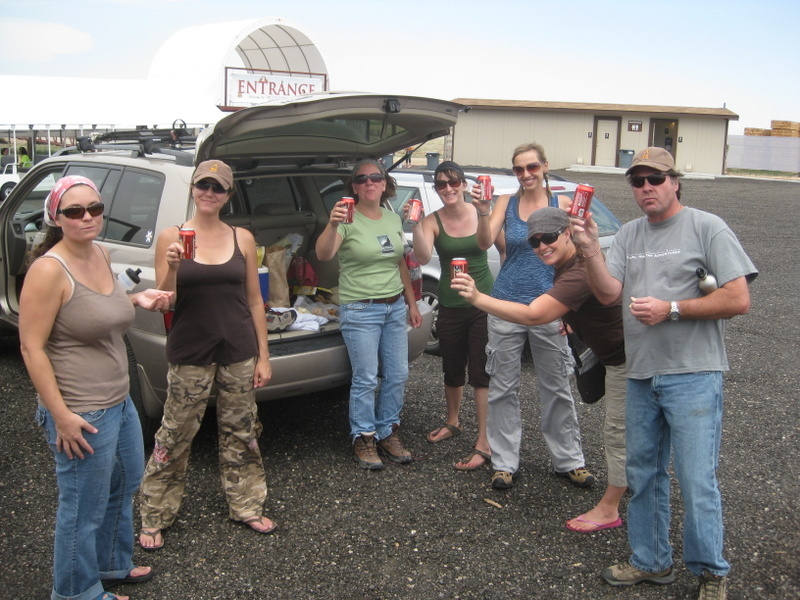 Toasting our labors with a celebratory beer in the parking lot! The Wild Animal Sanctuary is an amazing facility, and its dedicated staff work incredibly hard for the wellbeing of animals that have lived very traumatic lives. You can learn more about this nonprofit, the animals they house, and how you can help, on their website. Be sure to visit them when you’re in Colorado, or better yet, join the Nat Hab team on our next Staff Volunteer Day! There is no better way to see these exotic animals, unless of course you’re joining a Nat Hab wolf tour, Alaska adventure, or African safari!